On one hand, it’s one of the country’s best-kept secrets; on the other, the National Foundation for Advancement in the Arts has for the past 25 years been quietly shaping the future of the arts in the United States. Over that time, the organization has made $84 million available to over 10,000 young artists throughout America. Vanessa Williams, Josh Groban, Desmond Richardson, Alison Lohman, Roy Hargrove, Allegra Goodman, Rachel Moore and Hernan Bas count among the talent that NFAA has identified and supported as part of its determination to ensure the fostering of new generations of American artists. NEW YORK, NY – On April 24, Deborah Voigt, Debra Winger, Kurt Vonnegut, Christo and Jeanne-Claude, Ramsey Lewis and Michael Tilson Thomas will be among the presenters who will honor the most recent crop of 17- and 18-year-old NFAA winners. The celebration, entitled “Body & Soul,” takes place at the newly established Baryshnikov Arts Center in New York City and includes performances and exhibits by the award recipients in nine artistic disciplines: dance, film and video, classical music, jazz and pop music, photography, theater, visual arts, voice and writing. Selected from a national cross-section of 6,524 applicants, the initial 160 finalists participated in NFAA’s ARTS Week in Miami, January 9–15, where they spent an intense week collaborating with each other, working independently and taking master classes and workshops from such accomplished artists as Mikhail Baryshnikov, Michael Tilson Thomas and Placido Domingo. Of these 160 ARTS Week participants, a panel of distinguished judges selected a total of 38 medalists to be honored in New York City. The six Gold winners each receive $10,000, and the 32 Silver winners each receive $5,000. Fifty of the high school seniors are also nominated by NFAA to become Presidential Scholars in the Arts. In late spring, the resulting 20 awardees are honored at a ceremony at The White House where they, along with the academic Presidential Scholars, each receive the Presidential Medallion from the President of the United States. The 38 young artists to be honored on April 24 are: DANCE – Jonathan Campbell (Cedar Hill, TX); Garrett Coleman (Pittsburgh, PA); Rory Freeman (Providence, RI); Joseph Gorak (Orlando, FL); Justin Prescott (Missouri City, TX); FILM & VIDEO – Douglas Williams (Stonington, CT); Steven Wilson (Solvang, CA); JAZZ – Chase Michaels Baird (Lafayette, CA); Billy Buss (Berkeley, CA); CLASSICAL MUSIC – Samantha Fang (Sunnyvale, CA); Elizabeth Fayette (Wading River, NY); Michael Gilbertson (Dubuque, IA); Andrew Tyson (Durham, NC); PHOTOGRAPHY – Kathleen Ching (Brooklyn, NY); Adam Clunn (Cypress, TX); THEATER – Dustin Bronson (Rocklin, CA); Shalita Grant (Baltimore, MD); Caitlin Kimball (Winter Park, FL); Kelsey Kurz (Roselle Park, NJ); Tiffany Oglesby (College Park, GA); Amelia Pedlow (Philadelphia, PA); VISUAL ARTS – Leonardo Castaneda (Miami, FL); Orpheus Collar (Baltimore, MD); Sara Fowler (Wauwatosa, WI); Jordan Johnson (Houston, TX); Nicole Mourino (Miami, FL); Eloise Santa Maria (Houston, TX); Samuel Shea (Menomonee Falls, WI); Benjamin Sunderlin (Lafayette, IN); VOICE – Carlton Ford (Homewood, IL); Tatiana Mayfield (Forth Worth, TX); Rafael Moras (San Antonio, TX); Nadine Sierra (Delray Beach, FL); Grace Weber (Wauwatosa, WI); WRITING – Sarah Campbell (Birmingham, AL); Tassity Johnson (Houston, TX); Victoria Wegerski (Phoenix, NY); Kelly Wilson (Kirtland, OH). In addition to distributing a total of $550,000 in cash gifts among this year’s 160 ARTS Week finalists, NFAA also serves as an advisor to universities and colleges across America, facilitating the allocation of $3 million to $4 million in scholarship money each year. NFAA was established in 1981 by Carnival Cruise Lines founder, the late Ted Arison, to identify emerging artists and to assist them at critical educational and professional junctures in their careers. Arts Recognition and Talent Search® (ARTS) is a program of the National Foundation for Advancement in the Arts (NFAA). 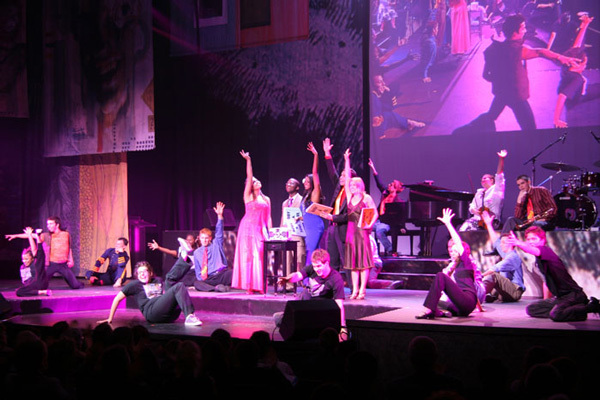 The NFAA ARTS program is sponsored, in part, by: Carnival Cruise Lines; The Coca-Cola Company; Gibson Guitar, Baldwin Piano and The Gibson Foundation; International Association for Jazz Education; The Jacques and Natasha Gelman Trust; The John F. Kennedy Center for Performing Arts; PricewaterhouseCoopers; Smithsonian Magazine; and SunTrust. ARTS Week 2006 was made possible, in part, by support from American Airlines; the Miami Herald; the City of Miami’s Office of Film, Arts, Culture and Entertainment: Special Events & Cultural Grants; the Miami-Dade County Department of Cultural Affairs, the Cultural Affairs Council, the Tourist Development Council, and the Mayor and the Miami-Dade County Board of Commissioners; The State of Florida Department of State, Division of Cultural Affairs and the Florida Arts Council, and the National Endowment for the Arts. For more information about NFAA, visit the website NFAA.ARTSawards.org.